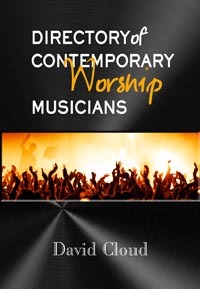 This directory contains information on influential contemporary worship musicians who are creating the music that is being used ever more frequently by fundamentalist and very conservative evangelical churches. All of them are radically ecumenical and the vast majority are charismatic in theology. To our knowledge, not one of them takes a clear stand against end-time apostasy. All are enemies of a separatist Biblicist stance. Contemporary worship music is a dangerous bridge both to the world and to the “broader church” with all of its ancient and end-time heresies, and the Directory of Contemporary Worship Musicians contains more documentation of this than has ever before been gathered into one volume, to our knowledge. The documentation contained in the Directory proves that Contemporary Christian Music is a jungle of end-time apostasy and that it is controlled by “another spirit” (2 Cor. 11:4). The music itself feeds the charismatic-ecumenical mystical experience. The sensual pulsing, skipping, tripping, body-jerking syncopated dance rhythms, the electronic modulation, the reverb and echo and feedback, the unresolving chord sequences, the pounding drums, the sensual vocal styles, the dramatic rise and fall of the sound level, and the repetition create an atmosphere in which charismatic seekers experience an emotional high, are hypnotized to receive an unscriptural message, and are prepared for “signs and wonders” phenomena. Book: Softcover, 542 pages, 5.5x8.5 in. eBook: Free, PDF, mobi (Kindle), and ePub formats.